Espheni: They are the creatures that are behind the invasion of Earth. They are bipedal creatures, humanoid-looking, gray, thin and very high. They use harnesses to control the skitters and children who were captured, so they are called colloquially as Lords by the resistance and by those who control. You can see them acting in administrative functions, overseeing the work of skitters and using Karen to talk to humans. At the end of the second season, “Red Eye” trough Ben reveals that his real name is Espheni and they are building a powerful weapon that is finally destroyed. Also they commented that each Espheni controls a sector of the world, and when a Espheni dies, humans could be more secure and safe for a while until they appoint another Lord in that part of the world. On occasion have referred to them as “Fish Face”. Skitters: Is the species as originally believed responsible for the invasion of Earth. Creatures are insect-humanoid-looking, fast moving with six legs and have a hard exoskeleton. It is also known that communicate with each other using radio waves and they use harnessed children to communicate with humans. Later, it is revealed that they are under the control of the Espheni, since they were harnessed by the Espheni after his planet was invaded by Espheni. However, some skitters have been able to resist control through yoke and they united to forge a rebellion against the Lords, allying with humans. 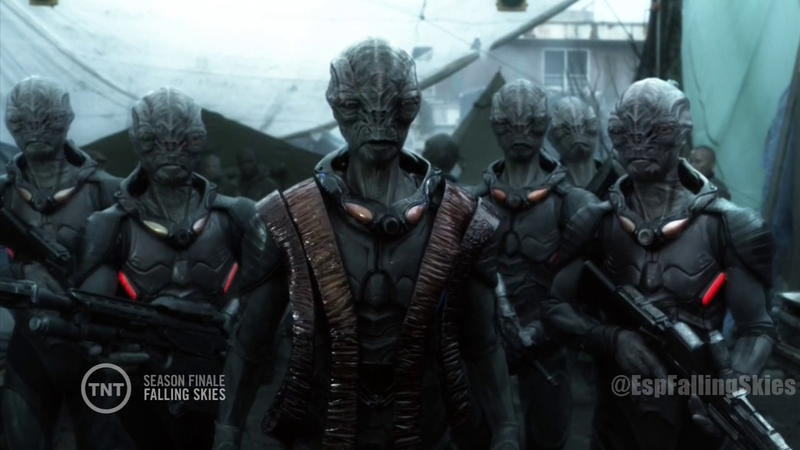 Volms: A new alien race landed on Earth at the end of season 2. Their planet was invaded by the Espehini and since then engaged in trying to save other planets that were also invaded. They have their stronghold on the outskirts of Charleston, and their technology has helped to resistance: new weapons and medical supplies. Their leader is Cochise, who is present at the meetings and provides information on possible attacks, along with his opinion. Apparently his intentions are good, apparently.